Placing a LiveChat on your 1&1 page will give you immediate access to your visitors and their needs. You will be able to answer their questions and handle their cases faster and more easily than via email or phone. Log in to the admin console of your page. Select Add Web Apps from the sidebar. Search for LiveChat and access the LIVECHAT application. Click on the To the Web App button. 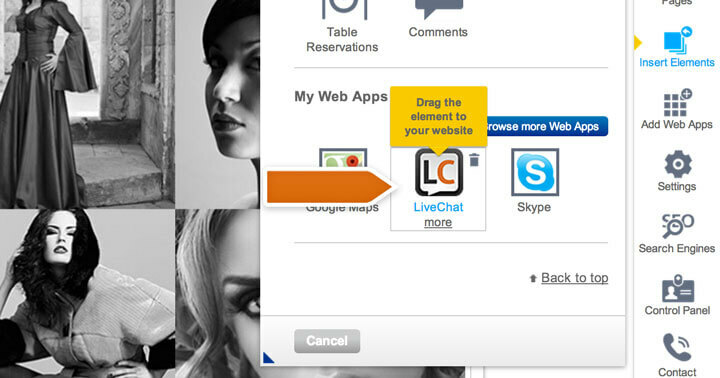 Drag the LiveChat app to your website. Type in your LiveChat account email address and finalize by selecting Save. When you complete the installation, all that is left to do is to log in to the LiveChat app. You can either use the web application or use one of the desktop apps. Simply log in with your LiveChat account and start chatting with customers. 73% of people found this helpful.